Leaders of the Log Cabin Republicans are inching closer to a decision on endorsing Mitt Romney for president and a final announcement could come this week pending the outcome of a meeting Log Cabin is seeking to have with the Romney campaign, according to a source familiar with the process. The source, who spoke on condition of anonymity, said Log Cabin wants to talk to the campaign about Romney’s views on LGBT issues and to seek his support for the Employment Non-Discrimination Act in particular. “We do think that once there’s that conversation that we will be able to move forward with the endorsement and actually feel good about it,” the source said, adding that if the board were to vote today, its members would likely support Romney for president. R. Clarke Cooper, the group’s executive director, acknowledged in an email to the Washington Blade on Monday that his organization seeks “clarity on workplace non-discrimination” from the Romney campaign. It’s not a secret Log Cabin has been asking Romney to come out in favor of ENDA. In an Aug. 13 op-ed for the Daily Caller, Cooper called on Romney to voice support for ENDA as well as commit to signing an executive order barring federal contractors from discriminating against LGBT people. While running as a U.S. Senate candidate against the late Sen. Edward Kennedy, Romney pledged in a letter to the Massachusetts chapter of the organization to co-sponsor ENDA “and if possible broaden to include housing and credit.” But in later years, Romney abandoned that position. He’s said he no longer supports ENDA, but hasn’t yet addressed the legislation during the 2012 campaign — largely because mainstream media reporters haven’t questioned him about the legislation. The Romney campaign didn’t immediately respond to a request for comment from the Washington Blade on the candidate’s position on ENDA. The “Mitt Gets Worse” campaign against Romney — co-founded by Rick Jacobs, chair of the Courage Campaign, and David Brock, founder of American Bridge 21st Century — have called on Log Cabin to withhold the endorsement. However, some gay Republicans — including D.C. Chair of the Republican Party Bob Kabel and former U.S. Rep. Jim Kolbe, have said they’d like to see the organization back Romney. In 2004, Log Cabin withheld its endorsement from then-President George W. Bush because of his support for the Federal Marriage Amendment — a position that’s shared by Romney. But the organization in 2008 backed Republican presidential nominee John McCain, who voted against the amendment in the U.S. Senate. 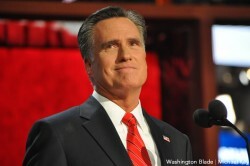 Mitt is only going to give you the same lip service that he gave the entire country during the debates. He does not like you, get over it. You're doing more harm to the LGBT cause than helping. Please return your Gay Cards to your local recruiting office ASAP. You may geek your free toaster oven as our gift to you. Republicans will lie for a vote, they have to to get elected, just stay away from busses. What more "clarity" can they possibly need? Mitt will replace liberal Justice Ginsburg with another Scalia. This will leave our nation with a Supreme Court completely hostile to equality, for decades. If Romney becomes president, we can say goodbye to federal rights for gay couples for a generation. Shame on LCR! LCR…miserable excuses for human beings. As the Founding General Counsel of the Gay Activists Alliance, Inc. and the legal advisor to the STONEWALL Veterans Association, I only have one question to ask you people….. How is it that even an earthworm knows that the robin is its natural enemy, but you haven't figured out the Republican party by now, just because you have a well paying job or a few bucks in the bank? Is it the DNA, or the water? I guess Log Cabiners are just going to have to wait until Mitt's in office to find out his position just like everyone will have to wait until he's in office to find out what's in his tax plan. (OW! My eyes just rolled completely out of my head.) Take it from a Baystater, LC – Mitt Romney does not care about you. Good luck getting any "clarity," especially on this topic, from Uncle Mitt.